There are a lot of apple juice drinks, but few specify the variety of apple. 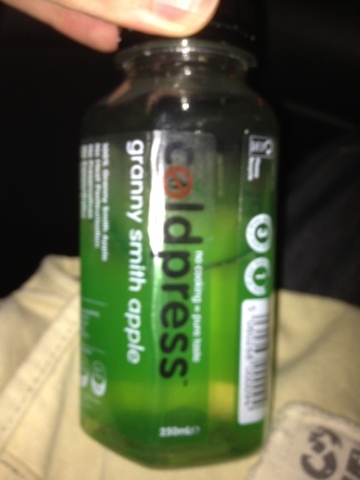 As this drink did and Granny Smith is by far my favourite (it's the green one with the strong flavour) I figured it was worth a shot. The gimmick of this one is that it is uncooked, and only pressure is used to remove all the micro organisms that cause problems. This ties in to the raw food craze from a little while back, but also has resulted in a clear, crisp flavour. This is another example of foods that use an unusual method of preparation to give a slightly different effect. While the bottle seems small this wasn't particularly expensive and is actually a very refreshing little juice drink. It actually tastes of Granny Smith apples, and when we live in a world of Golden Delicious flavoured things is rather nice. This would be a pleasure to drink again and something I'd try to find in a larger size.